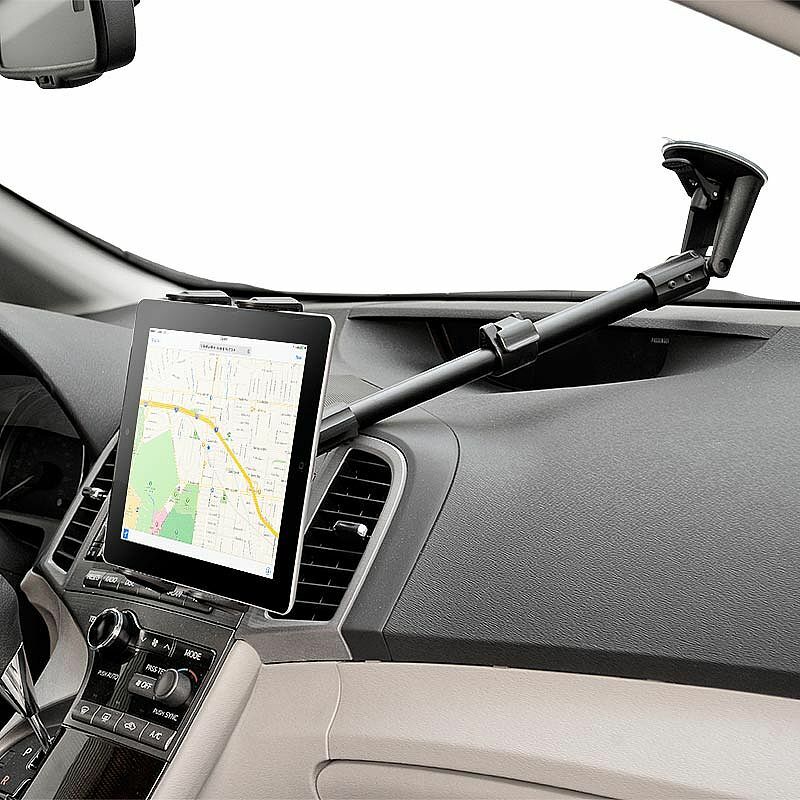 The mount’s sturdy adjustable arm extends 14.5" to 18.5"
The TAB-CM117 long arm extension windshield suction car mount is ideal for use with all large tablets 8.9 to 12.9 inches in screen size, including Apple iPad Pro, iPad Air 2 and iPad Air, iPad 4, 3, and 2, Samsung Galaxy Note 10.1, Galaxy Note Pro 12.2, Galaxy Tab 4 10.1, Galaxy Tab Pro 10.1, Galaxy Tab Pro 12.2, Galaxy Tab S 10.5, Kindle Fire HD 8.9, Google Pixel C, Nexus 10, and Nexus 9, LG G Pad 10.1, Sony Xperia Tablet Z4 and Tablet Z. 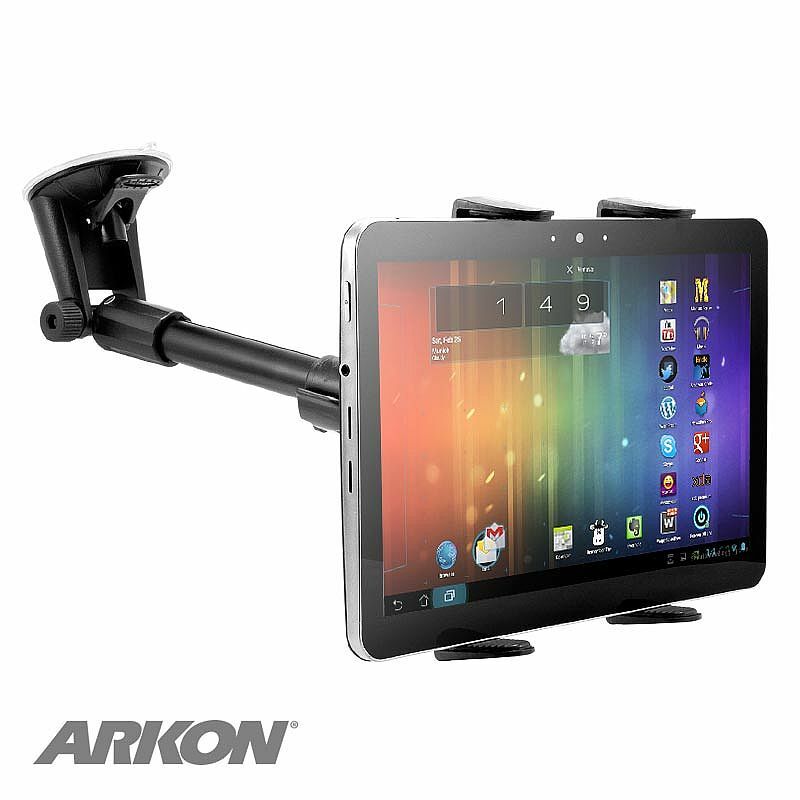 This mount includes Arkon’s Slim-Grip Ultra Universal Tablet Holder and a Rigid Long Extension Windshield Suction Pedestal with Telescoping Arm. 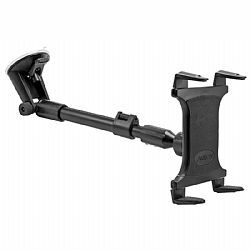 This mount is ideal for cars and especially trucks, vans, or delivery vehicles with deep dashboards. The sturdy telescopic arm of the pedestal extends from 14.5 inches to 18.5 inches, keeping the tablet within easy reach. The suction pedestal installs easily to the windshield. Simply hold the base against the mounting area and push down on the one-touch lever. The top and bottom adjustable-leg design of the spring-loaded Slim-Grip Ultra Holder makes it easy to insert and remove the tablet with one hand and helps keep any side buttons and ports unobstructed. Included with the spring-loaded holder are 8 support legs (4 short and 4 longer versions) that can be customized to provide the perfect fit for your tablet. For most tablets, the best mount holder configuration is to attach 2 short support legs on top and the 2 long support legs on the bottom of the holder. For smaller tablets, use all 4 short support legs on the holder. For larger tablets such as iPad Pro, use all 4 long support legs and mount iPad Pro horizontally. For vertical viewing, adjust the 360° swivel.